A fun game, plus science advancement. Computer gaming is now a regular part of life for many people. Beyond just being entertaining, though, it can be a very useful tool in education and in science. If people spent just a fraction of their play time solving real-life scientific puzzles – by playing science-based video games – what new knowledge might we uncover? Many games aim to take academic advantage of the countless hours people spend gaming each day. In the field of biochemistry alone, there are several, including the popular game Foldit. 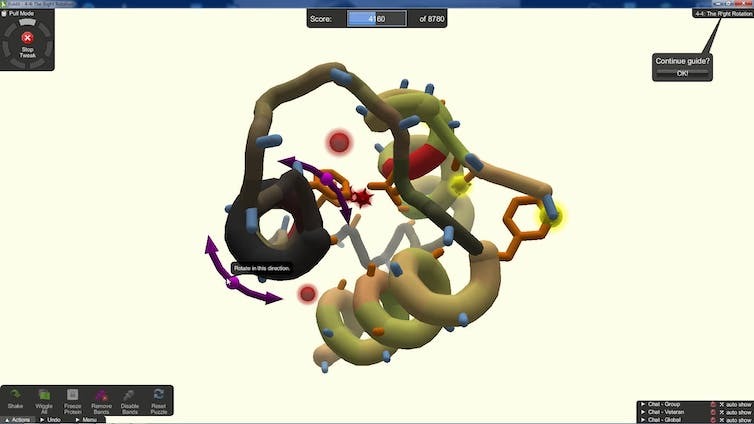 In Foldit, players attempt to figure out the detailed three-dimensional structure of proteins by manipulating a simulated protein displayed on their computer screen. They must observe various constraints based in the real world, such as the order of amino acids and how close to each other their biochemical properties permit them to get. In academic research, these tasks are typically performed by trained experts. Thousands of people – with and without scientific training – play Foldit regularly. Sure, they’re having fun, but are they really contributing to science in ways experts don’t already? To answer this question – to find out how much we can learn by having nonexperts play scientific games – we recently set up a Foldit competition between gamers, undergraduate students and professional scientists. The amateur gamers did better than the professional scientists managed using their usual software. This suggests that scientific games like Foldit can truly be valuable resources for biochemistry research while simultaneously providing enjoyable recreation. More widely, it shows the promise that crowdsourcing to gamers (or “gamesourcing”) could offer to many fields of study. Proteins perform basically all the microscopic tasks necessary to keep organisms alive and healthy, from building cell walls to fighting disease. By seeing the proteins up close, biochemists can much better understand life itself. Understanding how proteins fold is also critical because if they don’t fold properly, the proteins can’t do their tasks in the cell. Worse, some proteins, when improperly folded, can cause debilitating diseases, such as Alzheimer’s, Parkinson’s and ALS. First, by analyzing the DNA that tells cells how to make a given protein, we know the sequence of amino acids that makes up the protein. But that doesn’t tell us what shape the protein takes. An electron density map of a protein, generated by X-ray crystallography. To get a picture of the three-dimensional structure, we use a technique called X-ray crystallography. This allows us to see objects that are only nanometers in size. 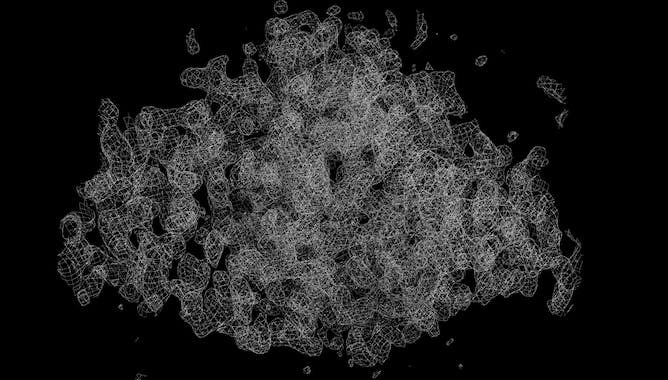 By taking X-rays of the protein from multiple angles, we can construct a digital 3D model (called an electron density map) with the rough outlines of the protein’s actual shape. Then it’s up to the scientist to determine how the sequence of amino acids folds together in a way that both fits the electron density map and also is biochemically sound. Although this process isn’t easy, many crystallographers think that it is the most fun part of crystallography because it is like solving a three-dimensional jigsaw puzzle. An electron density map of a protein with the protein threaded through the map, revealing how the protein folds. The competition, and its result, were the culmination of several years of improving biochemistry education by showing how it can be like gaming. We teach an undergraduate class that includes a section on how biochemists can determine what proteins look like. When we gave an electron density map to our students and had them move the amino acids around with a mouse and keyboard and fold the protein into the map, students loved it – some so much they found themselves ignoring their other homework in favor of our puzzle. As the students worked on the assignment, we found the questions they raised became increasingly sophisticated, delving deeply into the underlying biochemistry of the protein. In the end, 10 percent of the class actually managed to improve on the structure that had been previously solved by professional crystallographers. They tweaked the pieces so they fit better than the professionals had been able to. Most likely, since 60 students were working on it separately, some of them managed to fix a number of small errors that had been missed by the original crystallographers. This outcome reminded us of the game Foldit. Like crystallographers, Foldit players manipulate amino acids to figure out a protein’s structure based on their own puzzle-solving intuition. But rather than one trained expert working alone, thousands of nonscientist players worldwide get involved. They’re devoted gamers looking for challenging puzzles and willing to use their gaming skills for a good cause. Foldit’s developers had just finished a new version of the game providing puzzles based on three-dimensional crystallographic electron density maps. They were ready to see how players would do. We gave students a new crystallography assignment, and told them they would be competing against Foldit players to produce the best structure. We also got two trained crystallographers to compete using the software they’d be familiar with, as well as several automated software packages that crystallographers often use. The race was on! The students attacked the assignment vigorously, as did the Foldit players. As before, the students learned how proteins are put together through shaping these protein structures by hand. Moreover, both groups appeared to take pride in their role in pioneering new science. At the end of the competition, we analyzed all the structures from all the participants. We calculated statistics about the competing structures that told us how correct each participant was in their solution to the puzzle. The results ranged from very poor structures that didn’t fit the map at all to exemplary solutions. The best structure came from a group of nine Foldit players who worked collaboratively to come up with a spectacular protein structure. Their structure turned out to be even better than the structures from the two trained professionals. Students and Foldit players alike were eager to master difficult concepts because it was fun. The results they came up with gave us useful scientific results that can really improve biochemistry. There are many other games along similar lines, including the “Discovery” mini-game in the massively multiplayer online role-playing game “Eve Online,” which helps build the Human Protein Atlas, and Eterna, which tries to decipher how RNA molecules fold themselves up. If educators incorporate scientific games into their curricula potentially as early as middle school, they are likely to find students becoming highly motivated to learn at a very deep level while having a good time. We encourage game designers and scientists to work together more to create games with purpose, and gamers of the world should play more to bolster the scientific process.